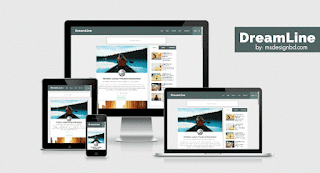 DreamLine is responsive blogger template which indicated that your website looks great on smartphones and tablet as good as they look on desktop devices. This template is compatible with all device. Responsive and mobile friendly blogger themes are most important in search results. So, use a proper responsive blogger template in your blog. A mobile friendly blogger themes play an important role. Cause maximum of visitors are come from mobile specially on android apps and games download site. So, its too much important to make your blog mobile friendly. Google also like a mobile friendly blog.